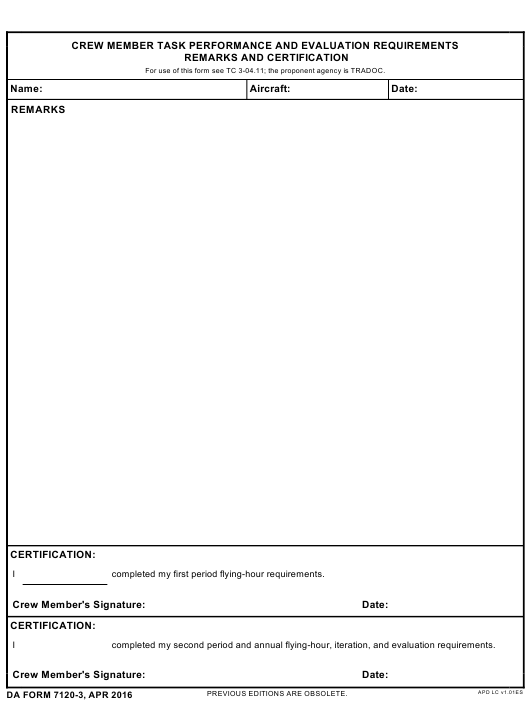 DA Form 7120-3 or the "Crew Member Task Performance And Evaluation Requirements Remarks And Certification" is a Department of the Army-issued form used by and within the United States Military. The form - often incorrectly referred to as the DD form 7120-3 - was last revised on April 1, 2016. Download an up-to-date fillable DA Form 7120-3 down below in PDF-format or look it up on the Army Publishing Directorate website. completed my first period flying-hour requirements. completed my second period and annual flying-hour, iteration, and evaluation requirements.